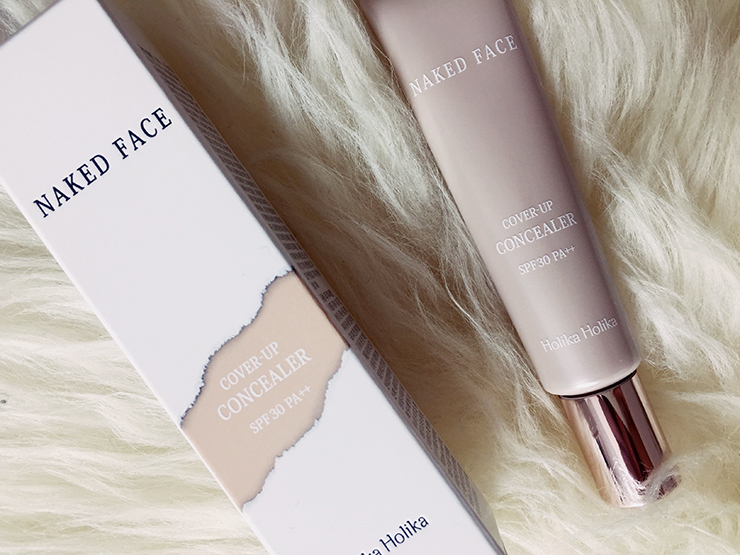 Today I'd like to introduce you to another concealer that I haven't heard much about in the blogging world so far, the Holika Holika Naked Face Cover-Up Concealer. Disguised in a mauve-colored tube is one of the most underrated concealers of the Korean beauty market in my opinion - forget Skinfood Salmon Dark Circle Cream! Or to say it with the voice of one of my favorite TV series: "...Queen you shall be . . . until there comes another, younger and more beautiful, to cast you down and take all that you hold dear." 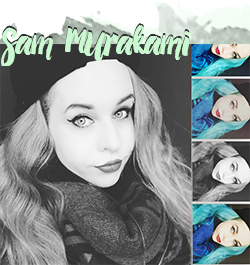 Okay, mabye a bit too drastic, but you get the idea. I have never tried anything from Holika Holika before - when I lived in Korea, the sales persons were way too pushy and always tried to sell me a whole moisturizing line for 100$ - afraid as I was - barely able to express myself in Korean - I fled their stores every single time. (And by the time I was able to voice "Thank you, but I'm just looking around" in Korean, my interest for this brand dropped below zero.) So here I am, back in Germany 9000km away from Korea, developing a new interest in a brand that doesn't seem too popular in the Asian beauty blogging world. Great timing. Challenge accepted. 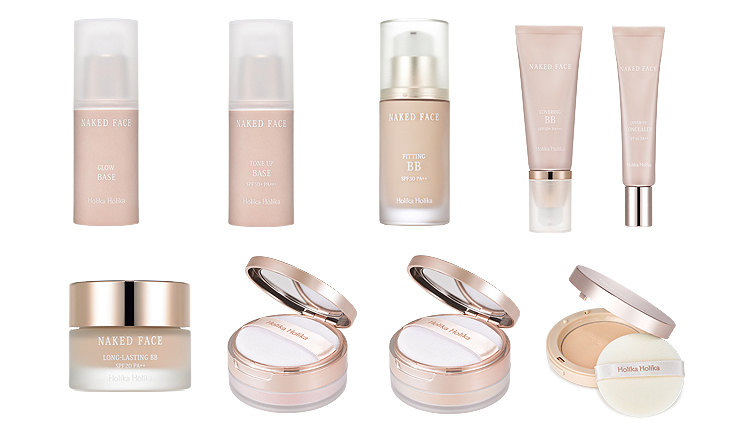 The Naked Face concept is actually a whole family of beauty products from Holika Holika - and such a pretty one! 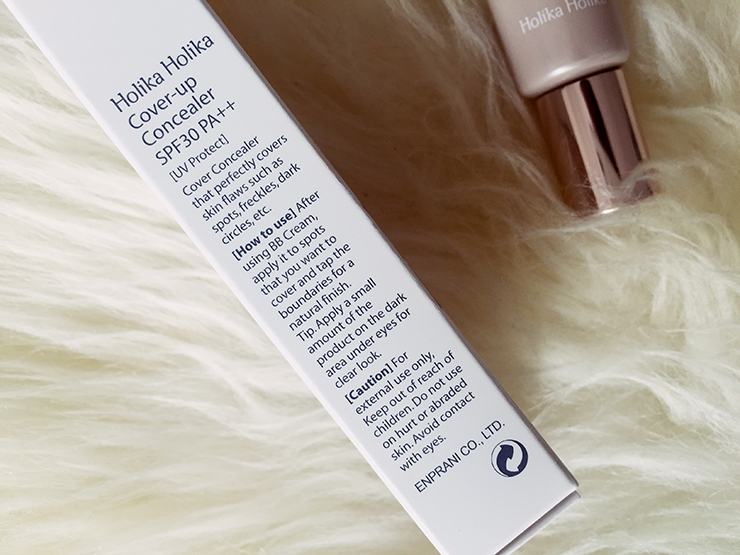 It ranges from primers over foundations to powders and has a solution for most skin problems be it covering or an even base that you're searching for. There are two shades available of this concealer (and every other product in the family) and as always, I picked the lightest shade 01 which is very similar in color and undertones to my Luna Long Lasting Tip Concealer. As always, the shades are very very limited to light skin shades which I always find such a shame but such is life, I guess. "Excellent adherence of pine resin extracted in pine trees sticks colors & ingredients of powder to skin naturally. That's why we can see the perfect sustaining effect of covering. White sapphire powder with 90% transparency scatters sun lights which reach to skin in various angles. So It can cover skin defects like wrinkle etc naturally. Moisture complex (hyaluronic acid, Cereus Grandiflorus (Cactus) Flower Extract ) , Multi- glow oil complex (Argan oil, Olive oil, Avocado oil) , pine resin & silicon powder gives skin moisturizing & high adherence effect." I personally really like the look of the packaging; the mauve-colored tube is something I haven't really seen as a concealer yet. I must say, that I would prefer a doe-foot applicator over the tube as I find it a little bit inconvenient to dab this on straight from the tube (always too much product) or use a brush for it but from a visual point of view, I really like to look at this. 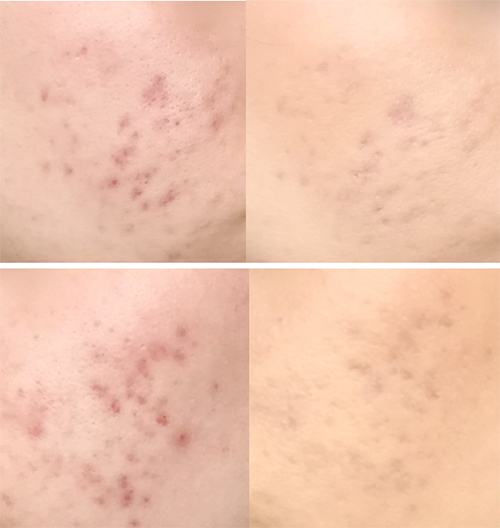 In terms of performance, I am extremely torn about this product: As you can see, it gives great coverage on my acne marks and hyperpigmentation. 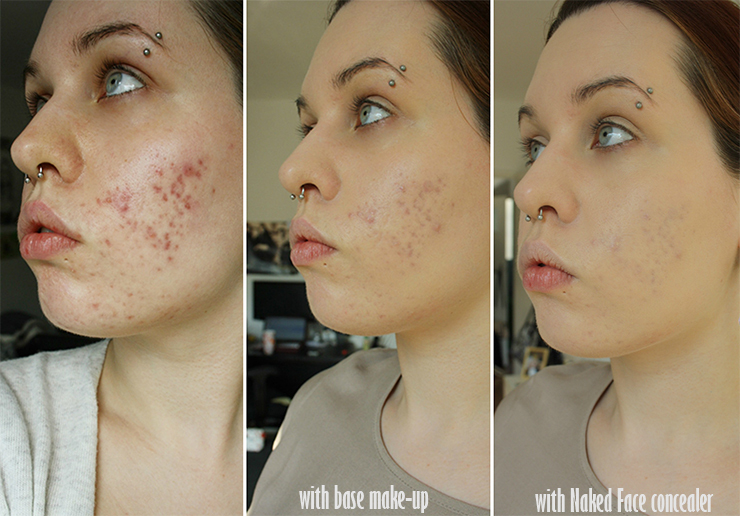 What is still visible with my base make-up almost disappears completely with the concealer without looking overly cakey. I applied the concealer first with a brush on my troubled cheek areas and then buffed it in with tiny motions with a cushion sponge. On my undereyes however..... it's a complete different story. You can't really tell in these pictures because the lighting makes my dark circles appear a lot less harsh than they are in real life but this concealer doesn't work well for me in concealing my dark circles. I think it may be due to the lighter formula, but somehow it looks a bit uneven and you can tell that I am wearing concealer which I personally don't like. 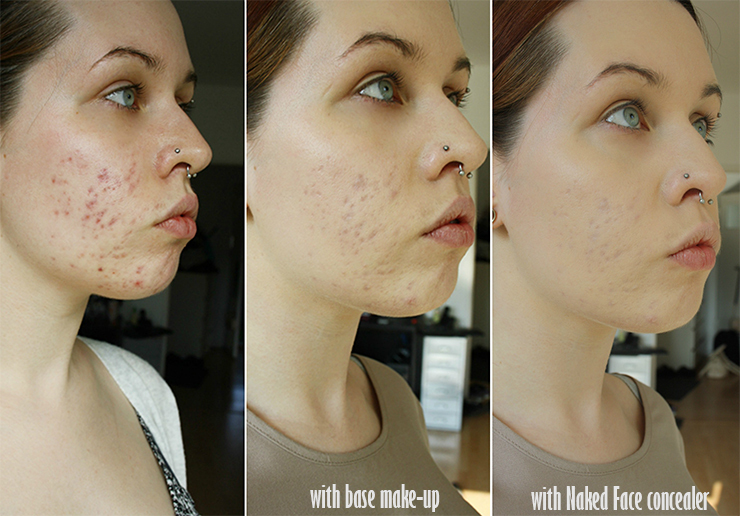 So as a final verdict, I really like the performance of this concealer a lot to use on my acne marks and hyperpigmentation as it gives a great natural look without being too noticeable but at the same time giving solid coverage. Also, the tube has a lot product and a little will go a long long way - I think this would probably last me forever! 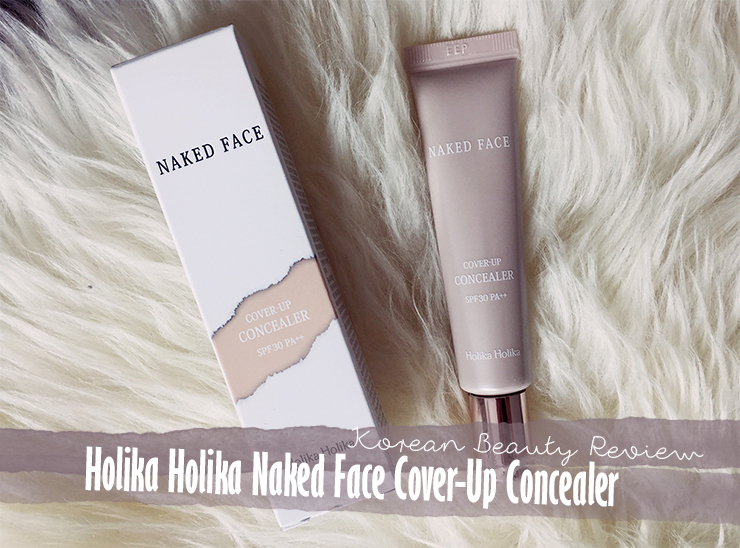 For the price I definitely recommend you give Holika Holika Naked face Cover-Up Concealer a try if you are still searching for a good concealer that has medium to full coverage. 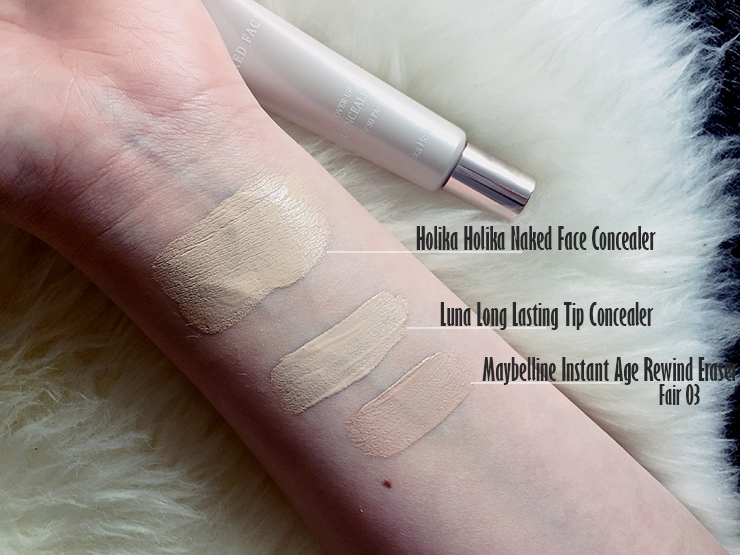 For dark circles, I will stay true to my beloved Luna Long Lasting Tip Concealer, but it might work if your dark circles aren't as bad as mine are. Giveaway is open until Monday, 27th of April. 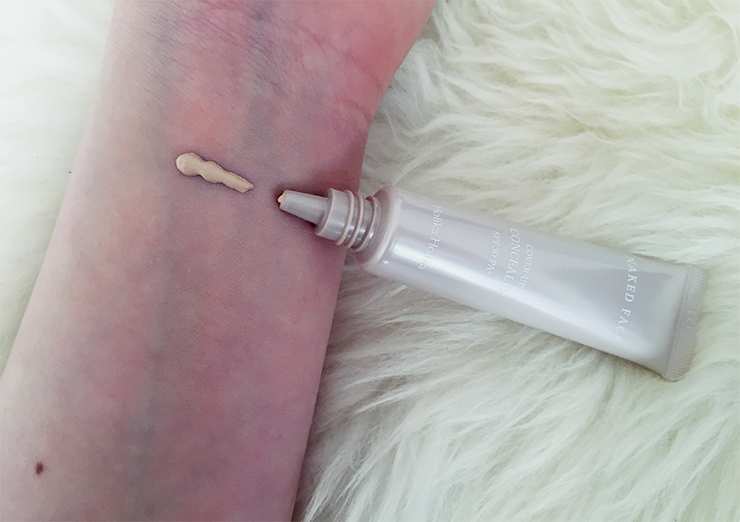 In order to enter, you have to be a reader of this blog either by GFC/Bloglovin/Facebook/Youtube and tell me why YOU need this concealer in your life! Convince me :D I will handpick the winner myself who gives me the most compelling answer. Good luck! If you have any questions unanswered feel free to write me a comment!